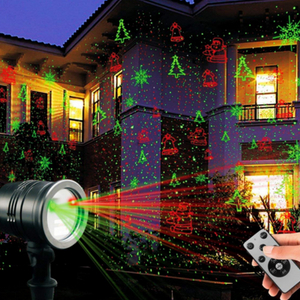 Looking for the best Christmas laser light? Or other fun Christmas lighting effects? We’re reviewed them all: Star Shower laser, Startastic Max, white Christmas laser lights, snowflake lighting projector, Window Wonderland … you name it! Perfect for both outdoor and indoor use. There’s something magical about a front yard sparkling and glowing with holiday cheer – so hop on board and transform your house into a beautiful winter wonderland with the best Christmas light projector! 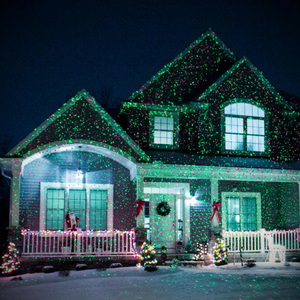 Here are our top picks for best Christmas laser lights! For reviews, click on any banner below. To read our in-depth reviews of each Christmas laser light, go here. Christmas Laser Lights are in! As you drive through your neighborhood around the holidays, you’ve undoubtedly noticed the trend that is Christmas laser lights. In the past several years more and more people are leaving their old string lights behind, in exchange for a laser projector or two. It’s not hard to see the appeal! Within seconds you can transform your front or backyard into a dazzling, shimmering, twinkling masterpiece. Neighbors walking by stop to admire the unique effect. As demand for these lights increases, many new products have emerged with exciting features. 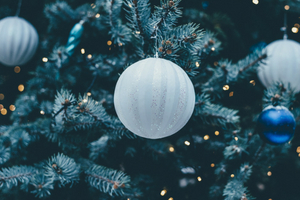 There are a lot of options out there, so we’re here to help you find exactly what you need to make your household shine this Christmas season. Have fun! Lasers vs. Traditional Christmas Lights? One obvious benefit of using Christmas lasers is you eliminate the tangled string of light scenario that haunts all too many decorators during the holidays. 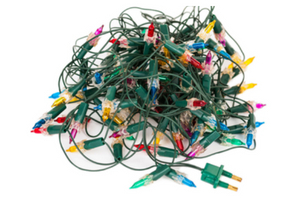 You swore to carefully wrap the Christmas lights so no tangles would occur, yet here you are again! This unexplainable phenomenon is similar to socks disappearing in the dryer… no matter how much you try to avoid it the problem persists! A great feature of laser Christmas lights is how easy they are to set up. Many models come with a simple garden-stake mounting system. You literally just have to plug them in (or put the battery in), turn on the unit, and watch everything shine. 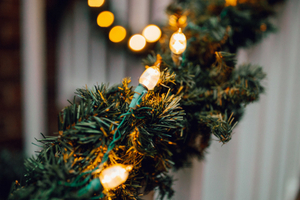 You eliminate the need for climbing up a ladder, stringing lights along the roof, or untangling cords. Traditional Christmas lights have a classic look to them. However, unless you want to spend hours stringing lights, it will take a lot of time and money to cover a wide area thoroughly. Logistically you’ll have to make sure each light strand is connected to another, not to mention power outlets. It’s definitely doable and worth the effort, but for some people the holidays are busy enough without creating a mini version of Disneyland’s light parade in their front yard! Many lasers are designed to cover extremely wide ranges, making them ideal for those wanting a more dramatic effect. Instead of hundreds of traditional lightbulbs, you can instantly enjoy thousands of red and green lights in your trees, on your lawn, or illuminating your house. With a fraction of the effort you can achieve a beautiful and dazzling effect. Around the holidays this is worth it. Not only do Christmas lasers potentially save you time, but they can also save you a lot of money. With traditional lights, to cover a large area can become relatively expensive. Older light strands stop working over time. There’s typically some maintenance needed from year to year as you replace bulbs. Again, this isn’t a reason to avoid traditional lights but are simply factors to consider. Although prices vary, the typical price range for outdoor Christmas lasers is between $20-100. 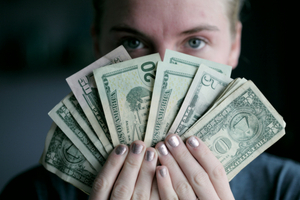 The more you pay the better laser you’ll get. As with most things in life, you get what you pay for! Point being, for a very reasonable price you can cover your entire house and yard with colorful lights. Instead of having to take down string after string, and carefully winding them up for next year, you can simply unplug your laser and store it away. Instead of hours of teardown time you’re looking at less than a minute (unless you walk really, really slow)! We’ve all seen those impressive programmed Christmas light shows at houses around the neighborhood. As cool as they are, not everyone has the time, energy, or desire to spend hundreds of dollars on light strands and other gear. In order to pull off even a simple Christmas light show, you often have to learn the basics of software, timers, and programming. While it’s certainly doable, many people prefer a simpler option. One great feature of many lasers is that they include pre-programmed shows. Depending on the device, triggering these shows is as easy as using a remote control. Please check out our reviews above to find lasers with built-in light shows. If you’re looking for something simple, where the lasers dance and move around in cool patterns, many companies make products that do just that. However, check out other models that not only feature moving lasers, but instead of projecting dots alone, can also project holiday shapes and graphics! For an example of this, check out the Star Shower Light Show. Step Up Your Christmas Creativity! It’s hard to say exactly why red and green lasers have such a popular decorating option for the holidays. Maybe it’s just because they’re wicked awesome! As we mentioned previously, lasers do save time and money. Setup is also easy compared to stringing traditional Christmas lights. 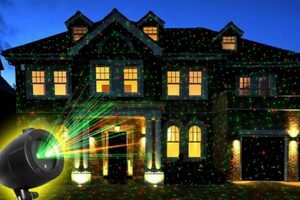 We feel another aspect of the popularity of Christmas laser lights is the fact that they provide a fresh, exciting spin on decking the halls (or to be more precise, the front yard). There are so many ways to get creative with lasers. Trying to brainstorm fun and unique ways to express your Christmas spirit, laser-style? We’ve got you covered! Here’s a few of our best ideas… merry Christmas! Idea #1 – Light Up Your Plants! We’re convinced that where technology meets nature, great things are bound to unfold! 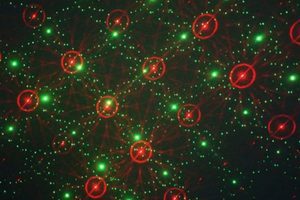 While traditional Christmas lights look great in trees, bushes, etc… lasers achieve their own unique effect that can be really special. The first approach is to set your laser on the ground, aiming the beams up into the branches. Your tree will appear to be glowing with thousands of vibrant stars. The varying depth of the branches and leaves will cause each laser beam to scatter and shimmer with the breeze. If you own a moving laser, the effect can be even cooler. A second idea for utilizing a laser with your trees is mounting it in the tree itself. Safely use a ladder or step stool to mount your Christmas laser to a branch or trunk. Aim the laser downwards towards the ground. 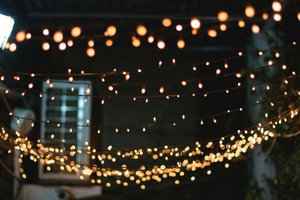 Your lawn or patio will instantly erupt with thousands of stars. Don’t bother worrying about buying a stand – just use a tree and incorporate the natural beauty that’s already in your yard. Alternatively, if you mount your laser to the tree itself, try aiming it downward towards the trunk. The closer you place the laser light to an object, the more concentrated the beams will project. The farther away you place the laser, the more widespread they will appear. If you’re able to mount the light directly to the trunk, you can angle it to illuminate the trunk only. Instead of showering a large ground area with lasers, you tree trunk will be colorfully illuminated and look awesome! If trees are a fitting setting to utilize your laser, why not bushes? In fact, one of the coolest ways to use your lights is placing it inside a bush. Most likely you will not want to place a laser in the dead center of a bush or shrub. Thick foliage will obviously block the laser beams from spreading out and creating your desired effect. However, it’s fun to partially conceal a laser by placing it partway in, with the beams pointed outward at your target area (especially if you don’t like the look of a laser light sticking out of the middle of your lawn). Placed in a manner described above, your laser will not look tacky but will still achieve the desired effect. 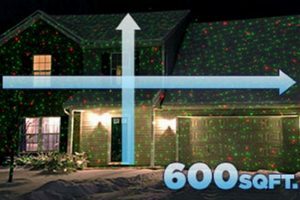 These are just a few ideas on how you can utilize the best Christmas laser lights in your setup. Every yard and house is unique, so be creative with the space you have. 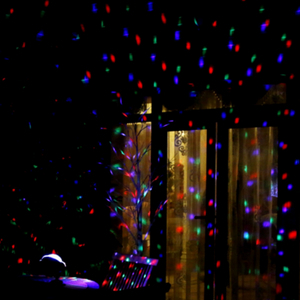 Have fun transforming your space into a light show all the neighbors enjoy. There’s nothing better than seeing friends stop as they walk the dog, pause, and admire your creation! Idea #2 – Make Your House Shine! 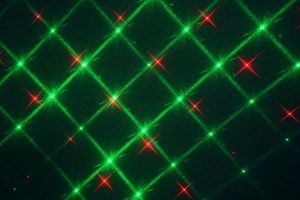 In addition to using Christmas lasers to light up your plants and trees, a huge fad around the holidays is “painting” your whole home with beautiful red and green stars (or whatever color laser you have). This is an area in which lasers truly do outshine traditional lights. Consider how easy it is to plug in a laser and point it as your house – not to mention the beautiful and drastic results you can get. Most people target their entire house, which works great. You can also consider lighting up a portion of your home. While it can be hard to direct lasers specifically, the best way to target an exact area is to move the light as close as possible to the desired location. Idea #3 – Make A Party Unforgettable! 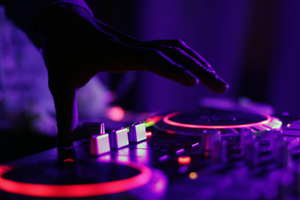 DJs have been using lasers for longer than most, in fact, until the last several years, the only place you’d see them is in clubs or parties. With the rise in Christmas laser lights, everyone’s in on the fun! While not every party or occasion calls for using lasers, they can add a lot to a party or dance floor. For outdoor events, the ideal place to utilize your light is the dance floor. Be careful not to place it directly at eye level, as this can potentially damage someone’s eyesight. The ideal spot would be above head-level, mounted to a tree, stand, or even part of your house. There’s just something exciting about a dance floor filled with laser beams… it makes you want to dance! For indoor events, the same tips apply regarding placement of your laser. For small and medium-size spaces, it’s probably better to aim your laser at the wall. This will help you avoid blinding someone with a harsh laser beam in the eye! Blank, open wall spaces look great with light beams projected on them. Add a little fog or haze to the room to help define each laser beam and take the effect to the next level! Are Christmas Laser Lights Safe? 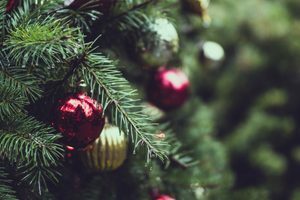 Since the average person is relatively new to using lasers, it’s commonly asked: are Christmas laser lights safe? 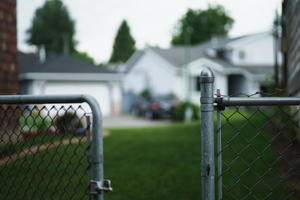 Do I need to take precautions to ensure the safety of people walking by my house? The quick answer is yes and yes. Yes, the products reviewed here are generally very safe to use around your house and yard. At the same time you should always consider the safety of those around you and take steps to ensure their well-being. The first noteworthy point is to make sure lasers aren’t directly aimed at peoples’ eyes. 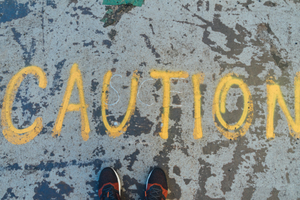 This is the most common danger associated with these lights and for good reason. We can’t make general statements about how long it’s safe to look directly into a laser, due to many variables. Make sure to carefully read all the safety warnings and information included in the product manual. None will be exactly the same of course, so that’s the best place to go. Ensure that you’re familiar with your light’s power and capabilities. Are Christmas laser lights safe for kids? 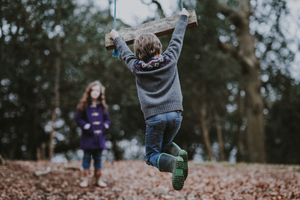 Because lasers are potentially harmful to the eyes, and many models use power from an outlet, always supervise children around your lighting. Children are wonderfully curious and are often fascinated with the thousands of red and green light beams being projected from a light. This can be a really fun experience for you and the kids, as long as its supervised. You definitely want to avoid allowing any child to stare directly and closely into the laser beams as they project. Also, make sure to watch children around outlets if your laser is plugged in. Most of all, have fun! Enjoy the wonder and awe produced by a high-quality laser Christmas light show. Safe for Pets and Animals? Are Christmas laser lights safe for pets and other animals? The general answer is yes. After all, how hilarious is watching a cat or dog chase a laser? Priceless! Just keep an eye on things whenever possible. If you have a puppy that enjoys chewing on everything in sight, make sure to place your light in a safe place. Please do not aim your laser directly in the eyes of any animal. Can Lasers Be Used Inside And Outside? A lot of people wonder if Christmas laser lights can be used inside as well as outside. While technically every outdoor laser can be used inside, mounting capabilities might be a concern. For example, many outdoor lasers come with a ground stake mounting system. They’re designed to stick directly in the lawn or dirt. This might be tricky to mount inside – although with a little creativity it’s possible! For example, fill a small bucket with dirt, wood chips or gravel… then stick your laser light into the bucket. Or use duct tape to mount your light to a post in your home. For indoors we suggest lasers that were designed to operate indoors, or at least come with a base stand that can be set on a table, countertop, etc. 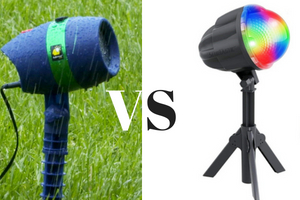 Before using a laser outdoors, make sure it was designed to perform in all types of weather! Rain, dew, and snow can damage your light if it wasn’t meant to withstand those elements. In summary, the best way to determine whether or not a laser should be used outside or inside is to check the manufacturer’s product manual. This will best guide you in how and where to enjoy your laser light. What’s the deal with As Seen on TV Christmas lasers? These days there are a few Christmas laser lights receiving a lot of attention. Several of these have been featured in As Seen On TV commercials. Two prominent products are: Star Shower Laser Magic and the Startastic laser. With any Christmas craze, skepticism is understandable. Product advertisements often make big promises but fail to deliver. 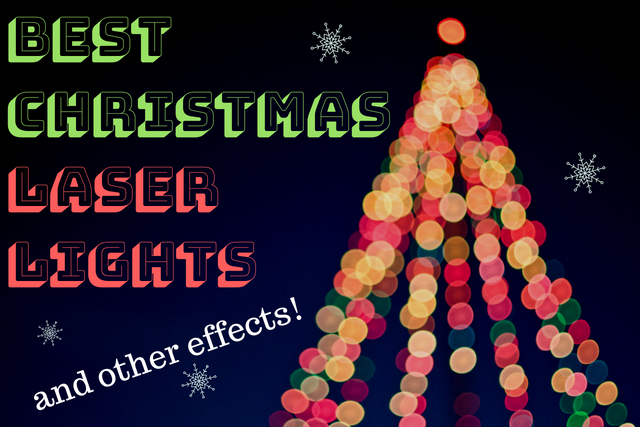 Let’s take a look at these two alleged “best Christmas laser lights” and see how they measure up! Let’s take a look at the big kid on the block. If you watch cable TV during the holidays, you’re likely to see an infomercial for the Star Shower Motion Laser Light. We have to say this, even before offering our thoughts, this company (BulbHead) is absolutely nailing the promotion side of things. They’ve created simple, easy-to-use, appealing products that are affordable. 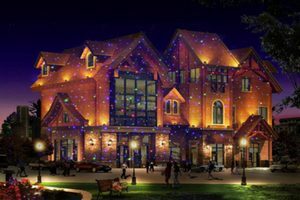 For example, the Star Shower Winter Wonderland is a simple projector that fills your window with cheerful holiday movies. Setup is simple – just place the 4×6 inch screen in any window of your choice and enjoy the view! For under $20 it’s hard to beat that. But does the Star Shower laser family live up to the hype? That’s the question we’re out to answer! To purchase a Star Shower you’re looking to spend around $20. 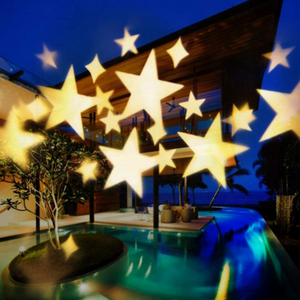 In our opinion, Star Shower Christmas lights are worth the investment for several reasons. First, products are affordable but durable. A lot of Christmas lasers on the market are cheap but hardly hold up to extreme weather conditions like rain or snow. Star Shower Christmas lights have a high IP rating and will perform well outdoors (make sure to follow the manufacturer’s instructions before using your product). Another aspect of the Star Shower laser line we appreciate is the creativity of each member. People searching for the best outdoor laser lights often have to wade through pages of online options, not knowing which are quality and which are not. This can be frustrating. Sometimes high-quality lasers are capable of only a few functions (for example, offering only static colors but no motion). Star Shower lasers offer a variety of options, putting a customizable show in your hands. If you’re looking to invest in a Star Shower laser light, one thing you’ll enjoy is how intuitive the features are. You won’t have to worry about confusing remotes or complex buttons. Every Star Shower laser comes with an instruction manual, but you can also find videos on each of their products. Part of the reason these lights are so popular is how easy they are to figure out. Another As Seen on TV Christmas laser light is the Startastic Max, which features powerful LED lights instead of lasers. 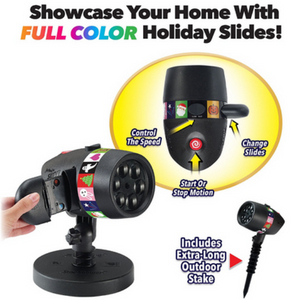 Sometimes this product is referred to as the Startastic Motion Holiday Projector. How does this product compare to the Star Shower Laser Magic? Let’s make some comparisons between the Startastic Max and Star Shower Laser Magic. In the end, both products are built from high-quality, durable, weather-resistant materials, are bright, and easy to operate. Here are some of the key differences between the two, if you’re weighing one against the other. The main difference to be aware of is that the Startastic Max uses LED lights and the Star Shower uses lasers lights. 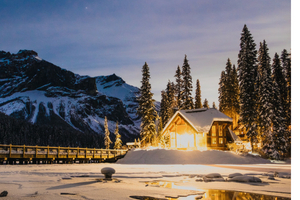 LEDs generally produce a more gentle, soft pinpoint of light, which could be compared to a snowfall projector. It’s a delicate look that is elegant and fun to watch. The Star Shower laser light produces bright, crisp, laser pinpoints that are smaller in diameter and a bit brighter. It’s equally beautiful but has a slightly different vibe. Both the Star Shower laser light and Startastic Max will cost you around $20. As these two products are in high demand, thankfully this has kept prices in a similar range. Here’s one difference that might push to you one side or the other. The Startastic Max produces red, green, and blue while the Star Shower only produces red and green. Some people prefer a more classic Christmas look (red and green only) while others enjoy adding blue into the mix. The choice is yours – choose the color options that make the most sense for your decorations and setup! Q: What is the difference between a Christmas laser light and a snowflake lighting projector? A: The main difference is the type of effect they produce. Christmas laser lights produce red, green, and blue laser pinpoints that typically are be operated static or motion. A snowfall projector uses LED lights to produce white snowflake-type dots that move in gentle patterns which resemble falling snow. Sometimes people search for white Christmas laser lights but this is a misnomer. Typically lasers are not white, LEDs are. Although there are few exceptions like the Full Spectrum White Laser. Q: What are the pros and cons of RG vs. RGB? A: Red and green laser lights have become a standard around the holidays. 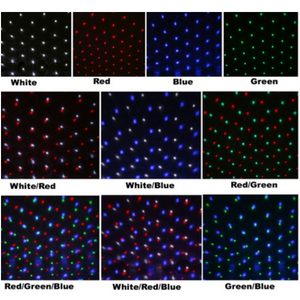 But in recent years, the emergence of RGB (red, green, blue) laser lights have become equally popular for Christmas decorating. When you’re creating an outdoor laser light show, both are viable options. Think about the color scheme and feel you’re going for and then choose colors that accomplish that. RGB lasers tend to make things look more whimsical and fun, while red and green tend to look more classic. Q: What is a motion holiday projector? 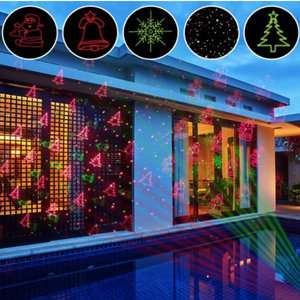 A: A motion holiday projector is a device that projects a moving holiday scene onto a small screen that fits in a window. The idea is that as people walk by, they’re greeted by a cozy holiday scene. 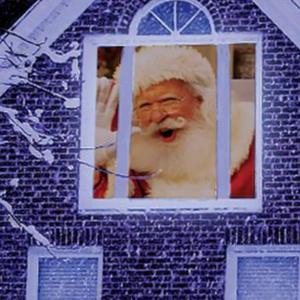 Imagine Santa smiling and waving out your window, or a serene crackling fire blazing away. 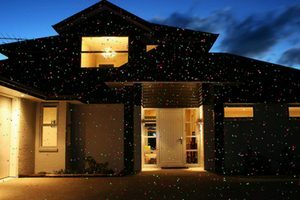 There are a lot of products on the market, but we think the best Christmas projector is probably the Star Shower Window Wonderland. Check it out here. 7 Lighting Modes: The LaserXplore really deserves to fall under two categories. Not only our red and green laser top pick, but also our built-in light show category. This light does it all! Select from various modes including blinking, static, or moving. You can also control whether the laser projects only red, only green, or a combination of both. The blinking feature creates a beautiful and magical starry sky effect that will bring new depth and excitement to your Christmas or party scene. Built-In Timer: When you’re creating a lovely atmosphere in your yard, the last thing you want to be hassled with is remembering to turn lights on/off each night. Thankfully the LaserXplore comes with a built-in timer. This unit automatically turns off/on when you need it to. 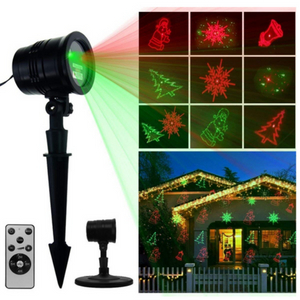 Effortless Setup: This Christmas laser is mounted with a simple and durable garden stake. Easily stake it in the ground, aim the laser wherever desired, and enjoy an incredible light show! There is also an indoor base allowing you to set this laser on any flat surface. This is a definite plus, as many lasers are exclusively for indoor OR outdoor use, not both. 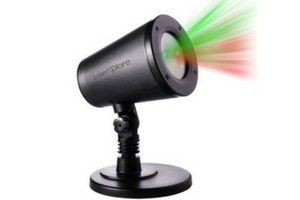 LaserXplore is a versatile unit you can get creative with inside and outside, whether it’s the holiday season or just an epic party! Weather Resistant: A major concern with any outdoor light is whether or not it can withstand the rigors of extreme weather. The LaserXplore is sun-proof, rain-proof, snow-proof, and dust-proof. It’s housing is rated at IP65, meaning it won’t be damaged from sprinklers or any of the weather elements mentioned above. You can rest assured this laser light will continue to function throughout the winter season (or whenever you’re using it). We don’t have any major reservations with this light. It’s solidly built, has fun and creative operation modes, and is affordable. One consideration might be: if you’re looking for a Christmas laser light that produces more than two colors, or projects images instead of dots/stars, we recommend checking out our other reviews in this article. The Star Shower Motion Laser has been popularized by it’s appearance on infomercials. 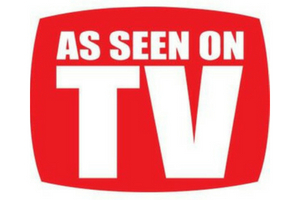 We understand your healthy skepticism about As Seen on TV products – many of which are less than quality. However, we’ve reviewed this one positively because we believe it genuinely works well and provides a really cool Christmas atmosphere. 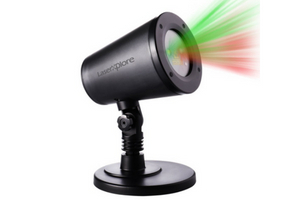 2 Laser Modes: The Star Shower Motion Laser has two basic lighting modes: red and green OR green only. This unit will not do solitary red. The lasers are bright and provide an even, broad coverage for your lawn, house, or entire yard (beams cover over 3,200 square feet)! 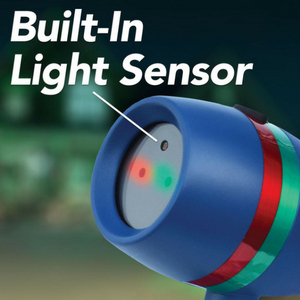 Built-In Sensor: One of the most convenient features of this Christmas laser is a built-in sensor, which turns on/off based on the amount of light in the surrounding environment. This feature removes the need to buy additional light timers, or the need to set reminders each day to turn on/off your lights. The Star Shower will do everything for you! Laser Motion: An innovative feature of this laser is an easy-to-use motion button, located on the top side of the light. 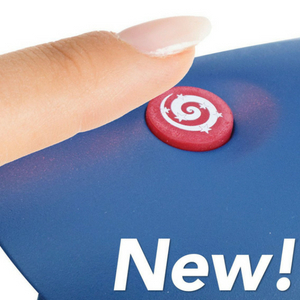 Simply press the button and watch the lasers twirl and move with stunning fluidity. It’s like the stars are dancing! A fun way to use this feature: at any point you can start and stop the laser motion by pressing the button (shown here to the left). Each time you stop the laser motion, the red and green dots will be in a slightly different position. Experiment and find the perfect look you’re going for. Weather Resistant: The Star Shower Motion Laser can be used both indoors and outdoors. It’s built to withstand rain, snow, lawn sprinklers, and direct sunlight. Rest assured that you can set this laser up and it will illuminate your house for season after season. No major drawbacks. One thing to know however – the included power cord is fairly short, so you’ll probably need an extension cord when using the Star Shower Motion Laser. If you’re looking for a great RGB laser, you definitely want to check out the SUNYAO tri-color motion laser. This laser is lightweight, durable, weather-resistant, but most importantly features RGB lasers (red, green, blue). Why invest in this one? Most Christmas laser lights you’ll see out there feature red and green only… so take things up a notch! The high-quality blue lasers in this unit will add an incredible sparkle to your holiday or party celebration. Timer: Thankfully the SANYAO 3-color laser includes timer settings of 2, 4 or 6 hours. This means you won’t have to worry about turning the light off… it does it for you! Motion: What’s cooler than static lasers? Moving lasers, of course! Enjoy smooth firefly patterns as the lasers move around on whatever surface they’re projected onto. 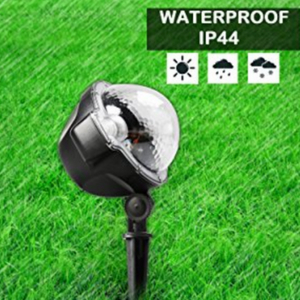 Weather-Proof: This laser light has a IP65 rating so no worries about using it outdoors. It’s ready to go in sun, rain, or snow! Remote Control: Here’s one area SANYAO has set themselves apart with this product – the inclusion of a handy wireless remote. 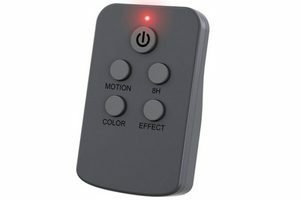 This remote allows you to control functions including: on/off, motion (including speed), flash, timer, and color. When it’s freezing outside, you won’t have to run out to turn this laser on! That in itself is worth it! This light is a little more pricey than other models, but we feel it’s special features make up the difference. Not only does this unit produce blue lasers, but it comes with a remote. The best Christmas laser light, in the RGB category, is the LedMall RGB Laser. This is not a cheaply-made model that will work well for one holiday season then break. 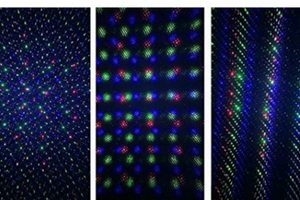 What sets this laser apart is not only it’s ability to produce red, green, and blue, but also it’s exciting motion features (more on that below). Complete with an easy-to-use remote, the LedMall RGB would make an incredible contribution to your festive outdoor display! Coverage: The LedMall RGB Laser is capable of covering up to 2,500 square feet. This light will fill up very large spaces with dense, beautiful laser lights. 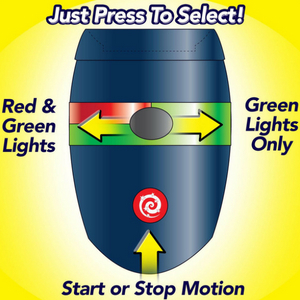 Laser Motion: As mentioned above, a standout feature of this laser is the 20+ motion modes, including the following: flashing in each individual color, static in all colors, and any combination of two colors. Using the handy remote included with this light, you can easily toggle between modes. While many lasers don’t allow you to isolate each color, or combine them in creative ways, the LedMall gives you total control. Additionally you can control the speed and motion-pattern of the lasers. They’ve made it easy to create a custom look that’s perfect for whatever you’re doing. Mix it up throughout the holidays to keep things interesting by rotating through a different setting every night! Timer: The LedMall is easily controlled via several timer options (use the remote to control settings). Timer settings include: 2, 4, 6, and 8 hour durations. Don’t hassle with buying extra light timers – just plug in this laser, choose a timer setting, and enjoy! 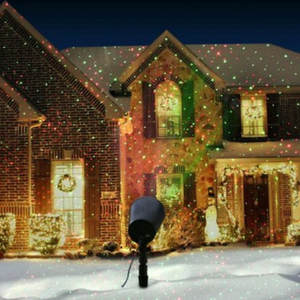 Durability: This Christmas laser light is built to last and may be used indoors and outdoors. A durable metal housing is built to withstand front yard usage (rating: IP67). A 25-ft power cord makes it convenient to plug into the nearest outlet. Although the StarTastic Max is not technically a laser, it made our list because of its cool moving LED light effect. In many ways it resembles the firefly laser effect, but with a twist. See the product video below to get a feel for what it looks like! 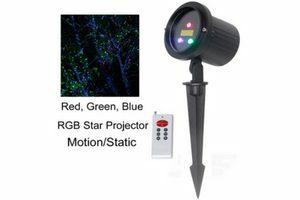 Colors: The StarTastic Max Motion Light produces red, green, blue, and white. One of the reasons we love this light is its extensive color palate. 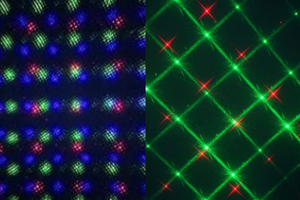 You can combine these colors in a variety of ways to create the perfect custom light show! Energy Saver: As you probably know, LED lights typically use far less energy than conventional Christmas lights. One of the biggest challenges many people face when decorating for the holidays is increased electricity bills. You should feel free to enjoy your holiday display without worrying about expensive bills… the StarTastic Max will give you this peace of mind thanks to its low power consumption. Light Shows: Here’s where the StarTastic really shines – this light comes with 122 lighting effects! Combine colors and motion patterns to create the exact atmosphere you’re going for. 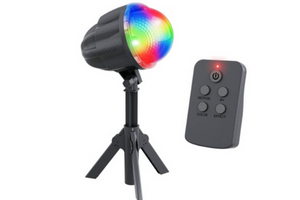 Whether you want an elegantly illuminated ballroom or exciting flashing colors, this light is up to the challenge. Remote: The StarTastic comes with a simple remote that gives you access to 122 lighting effects! You can turn motion on/off, switch colors, etc all from the comfort of your home. No need to step outside or touch the light itself. Once it’s set up just grab the remote and you’re good to go! We don’t have any major hesitations – this is a fantastic product. One thing to note: since the StarTastic Max utilized LEDs instead of lasers, it won’t project quite as far. According to the manufacturer, this light projects up to 50 feet away (which is suitable for most yard applications, as well as inside use). Just something to be aware of! The LedMall Firefly Laser made our top list of Christmas lasers with built-in light shows because, as you will see, it comes with some beautiful and creative options. This unit only produces red and green lasers, making it ideal for the holidays. It also includes white LED lights to add extra punch to your light show. Make sure to check out the product video below so you can see this light in action – you’ll understand immediately why it’s one of our favorites! 12 Laser Patterns: What truly sets this laser apart is the built-in, dazzling light shows. Christmas lasers are all the rage, which means people are accustomed to seeing them around the neighborhood. Step up your game a notch and provide something more interesting with this unit. Using the included remote, choose one of the 12 motion patterns and enjoy. 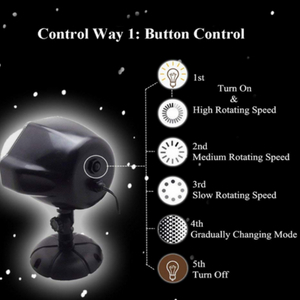 Remote Control: Thanks to the included remote, you can control the LedMall Firefly Laser simply and quickly. You can choose from any of the 12 light shows, set timers for 2, 4, 5, or 8 hours, and turn the unit on/off manually. Weather Resistant: This laser is good to go indoors and outdoors. It has a solid metal housing and is water proof (rating: IP65). Color Options: The LedMall Firefly not only features beautiful red and green lasers, but also includes white LED lighting which adds to the light show. 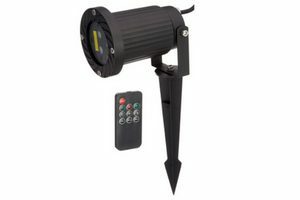 This LED also makes a great path light, in case you want to light up an area in your yard. This feature is yet another reason this laser made our list! The StarTastic Holiday Light Show is a fun and powerful laser light show that will cover an area up to 4,000 square feet! You can set it up in 30 seconds, using the adjustable lawn stake to aim the lasers exactly where desired. This light is perfect for indoor applications as well – use it to light up a party room, yard, or gym. Colors and Motion: This product is simple but elegant. It produces hundreds of red and green lasers and 4 motion modes. Modes include: green moving lasers, red/green moving lasers, green static lasers, and red/green static lasers. Choose the mode that fits your occasion and go for it! Weather Resistant: The StarTastic Holiday Light Show is built to withstand outdoor elements including rain, snow, and intense sun. Rest assured this product can be placed in your yard and will work well. No major concerns. This light does not feature as many motion patterns as the others in our “Best Light Show” category, but it’s still a solid laser. Sometimes simple is better – it just depends on what you’re going for! 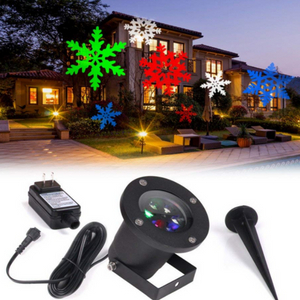 The Zerhunt Star Shower Laser is an extra bright, option-packed red and green Christmas laser light. Not only does this light produce the typical red and green dots (or stars), but it also projects fun holiday images including snowflakes, bells, Santa Clauses, and bells! This light easily qualifies for several categories on our list, including best holiday image laser, but we placed it here because of it’s exciting light show capabilities. Read below and discover why the Zerhunt Star Shower Laser will take your Christmas display to the next level! 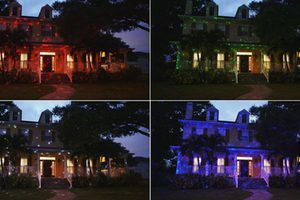 Versatile Light Show: During the holidays it’s becoming standard to see houses and yeards brilliantly illuminated with red and green laser lights. The Zerhunt Star Shower is a great way to join the fun, but it also gives you increased creativity. This light projects fun holiday shapes (standard laser dots, snowflakes, bells, Santa Clauses, and bells). Additionally, this light has 5 exciting show patterns to choose from. A brand new blinking mode will create a stunning starry sky effect. Area Coverage: Even a larger yard is no problem for this Christmas laser light. It can cover up to 3,900 square feet from a distance of 32 feet. Additionally, this light rotates 360 degrees allowing you to direct beautiful projections in whatever direction you desire. Just set it up, adjust the angle, and enjoy! Automatic Timer: Thankfully many laser manufacturers are including timers with their products, and the Zerhunt Star Shower is no exception. A handy dawn/dusk setting ensures this laser will turn on when it’s dark and turn off when it’s light out. This saves you the trouble of setting reminders or investing in additional products. Other timer options include 2, 4, 6, or 8 hours. 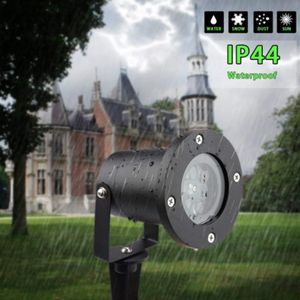 Weather Resistant: According to the manufacturer this light is “sunproof, rainproof, snowproof, and dustproof.” The housing on this light is rated: IP65. Rest assured this laser will withstand operation outdoors, even in the midst of winter or summer when conditions are most harsh. 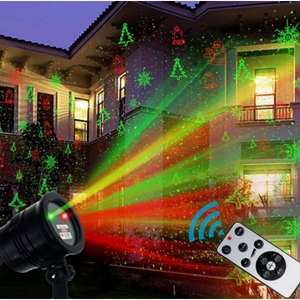 Remote Control: We love the fact that this Christmas laser light comes with a remote! This remote has a working range of 39 feet. This means you can turn on/off the unit, as well as adjust the settings, from the warmth and coziness of your home. Not at all. This is one laser we highly recommend because it provides the best of several worlds – remote control, inside and outside mounting systems, projected holiday patterns, red and green lasers, and static/motion options. The Zerhunt Star Shower Laser is a must-have! 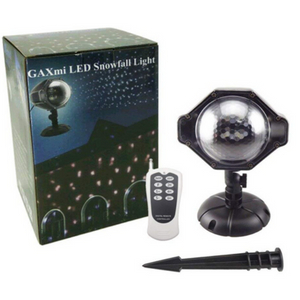 The GAXmi LED Snowfall Projector is a truly unforgettable Christmas snowflake lighting projector! One of the most memorable trends in outdoor holiday decorating currently is the “falling snow” effect. Not only can you transform your yard, driveway, or entire house into a winter wonderland of gorgeous, cascading snow, but thanks to a well-thought-out remote, it’s simple to operate. 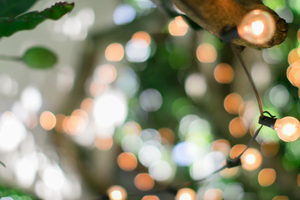 Beyond holiday decorating it’s perfect for weddings, parties, and special events. 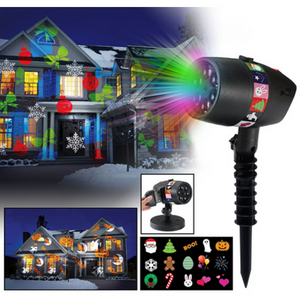 That’s why this Christmas snow projector is high on our list! Falling Snow: If you’re looking to implement a breathtaking snowfall effect into your Christmas setup, you’re going to want good coverage. A tiny snow storm simply won’t do! The GAXmi LED Projector covers 15-50 square meters and may be placed anywhere from 9.8 – 19.7 feet from the projection surface. To adjust the area coverage, simply reposition the projector and enjoy! 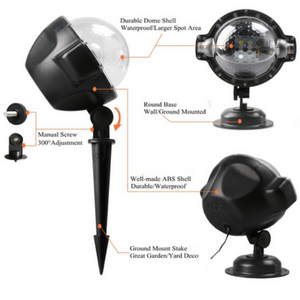 Multiple Mounting System: This snowflake lighting projector is ideal for both indoor and outdoor use. Using a long, durable mounting stake, it’s simple to mount the GAXmi LED Projector into the ground – in your lawn, gravel, or landscaping. It also includes a round stand base, allowing you to place it on solid ground or even mount it to the wall using screws. 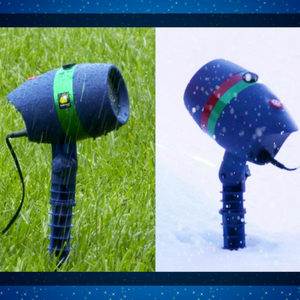 A handy 300 degree projector head is easily adjustable allowing you to project snow exactly where you want it! A Customized Show: Here’s a quick overview of the ways you can customize the beautiful snowfall effect this product produces. As mentioned above, this unit is controllable by way of remote control or using the simple button located on the back of the projector itself. This projector features three rotating speeds. Choose one that projects snowflakes falling at exactly the speed you want. Create a vibe that’s ideal for your event. There’s even a “gradually changing mode” to give the snowfall a real-life look and feel. Timer Options: This snowflake lighting projector is designed with a built-in automatic timer, saving you the stress and worry of manually turning the unit on/0ff. The default setting for this light is 6 hours of operation. It will then automatically turn itself on again after 18 hours. Other customizable timer options will ensure the light works for: 2, 4, or 6 hours. 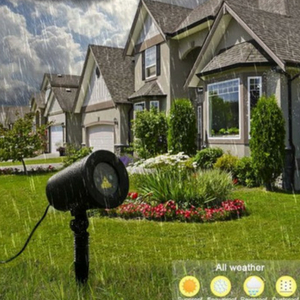 Weather Resistant: The GAXmi LED Snowfall Projector is ready for use in all types of weather, including rain and snow. The manufacturer does not recommend exposing this light to heavy rain so bear that it mind. Both light and power cord are waterproof with a rating of IP65 (light) and IP44 (plug). This light is built to last so you can enjoy it for years. We’ve placed the GAXmi LED Snowfall Projector at the top of our list for obvioius reasons – first and foremost the snowfall effect itself is stunning. You can control the speed and appearance of the effect. It’s reasonably priced. We love the fact that customizing settings is possible from a simple button on the unit, as well as a remote control. With a solid IP rating (65) you can rest assured this snowflake lighting projector will withstand the harshness of winter weather. With Christmas cheer and enthusiasm we encourage you to check this one out for yourself! When looking for a snowflake lighting projector, it’s common to find products that produce white circle-shaped snowflakes. But we’ve found something extra special – the Koot White Snowflake Projector. What sets this light apart is this: it produces beautiful, multi-colored snowflakes that aren’t just dots, but full-blown flakes! The beauty and shape of snowflakes shine through in a way most projectors don’t deliver. This product will take your Christmas decorating to magical new heights! Snowflake Pattern: Like mentioned above, this snowflake lighting projector doesn’t produce typical white dots. Instead it projects white, red, green, and blue snowflakes! These look great projected onto a wall or building for the holiday season. Other possible applications include projecting snowflakes onto the dance floor. The unique look of this light would be ideal for a school dance with a winter theme. It’s elegant, bright, and versatile. Brightness: The Koot White Snowflake Projector utilizes 3-watt lamps making the snowflakes bright, crisp, and beautiful. Multiple Mounting: There are two easy mounting methods that comes with this light. First, you can stake it into the ground. Just pick a great spot on your lawn, stick it in the ground, and enjoy! The Koot Snowflake Projector also includes a sturdy hanging bracket, so you can mount it to the wall or ceiling. According to the manufacturer, this light should be somewhere between 5 to 15 feet from the projection surface for optimal results. Weatherproof: As with all lights in our top list of Christmas lasers and other effects, this snowflake lighting projector has an IP65 rating. It can safely be used both indoors and outdoors. Snow, rain, and heavy sun are no problem! We have no major drawbacks. One thing to consider: you must set up this light within 5-15 feet from the surface you’re projecting onto. Depending on your setup space, this could pose a problem. For the most part, this works perfectly and isn’t an issue. 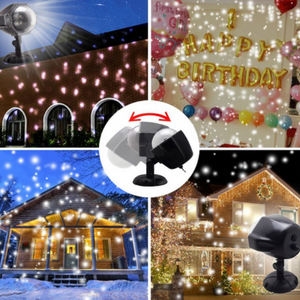 The EAMBRITE LED Party Light is a snowfall lighting projector we’re very excited to introduce. What makes this product stand above is it’s color diversity: it features 10 color combinations (using white, red, green, and blue). This means that, in addition to projecting beautiful white snow onto your home, yard, or wall, you can also create multi-colored snowflakes. It’s a colorful flurry sure to catch the eyes of neighbors and friends! 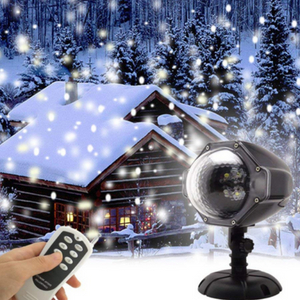 If you’re looking for a high-quality snowfall lighting projector, this is one to check out! 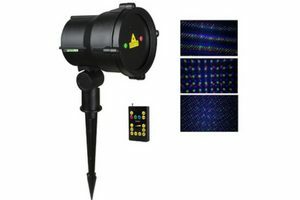 Multi-Color Beauty: As mentioned above, the EAMBRITE LED snowfall projector is capable of producing four colors, as well as 10 various color combinations. This means you can get super creative with your snowfall presentation. Change up the look of your decorations from night to night, or year to year. Thanks to the multi-color options of this unit, you’re not limited to Christmas or holiday decorating only. This light could easily be used for school dances, corporate events, banquets, birthdays, or dance parties. DJs will benefit greatly from this projector, whether it’s in a hotel ballroom or backyard. Wide Coverage: A helpful feature of this snow projector is it’s wide range of coverage (up to 5,500 square feet at approximately 25 feet away). Don’t need that much coverage? Simple, just move the projector closer to your projection surface. Either way it’s nice to have such a wide range of coverage in case you need it! Weather Resistant: The EAMBRITE LED Party Light is well-built and ideal for both outdoor and indoor use. 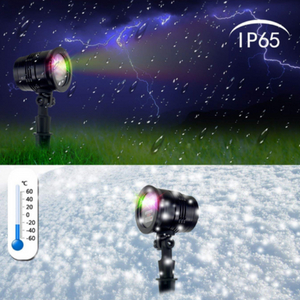 We don’t have much to say negatively about this snowfall lighting projector. It’s well-built and offers 10 stunning color combinations. We think you’ll enjoy the results! The Star Shower Slide Show is a newer addition to the well known, As Seen on TV, Star Shower laser series. 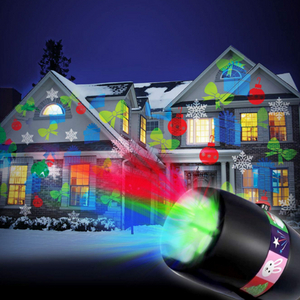 This fun projector will beautifully illuminate your house, or any other big surface, with colorful holiday slides. The motion of each holiday shape is smooth and charming, not overwhelming or jerky. Please peruse some of the review videos below to see firsthand how the effect looks. How It Works: As always, Star Shower has made it easy to operate this product. Simply place one of the 12 included holiday slides and slide it into the port in the light itself. Press the motion button to select your desired speed, then enjoy the show! Important: always make sure to follow the the manufacturer’s instruction manual when operating this light. Easy Slide Technology: One of our favorite aspects of this holiday projector is that it gives you options! The Star Shower Slide Show comes with 12 full color slides. You won’t be limited to Christmas because the included slides include images perfect for the following holidays: Halloween, Valentine’s Day, Easter, Patriotic, and Birthday. Indoor and Outdoor Use: The Star Shower Slide Show is perfect for indoor and outdoor use. It’s weather-resistant housing is made to withstand temperatures ranging from -30 degrees Fahrenheit to 100 degrees Fahrenheit. It comes with an extra-long garden stake allowing you to place it securely in your lawn. Additionally, this unit includes an indoor base so you can set up the light on any flat surface. A fun idea is to use this light with your kids in the living room or bedroom. Just turn off the lights, flip on the Star Shower Slide Show, and enjoy watching the beautiful projections dance around the walls and ceiling. This light would also make a fun addition to a dance floor or indoor party. No major drawbacks with this incredible light! Our only suggestion is this: since the Star Shower Slide Show is designed to project LED images, you might consider investing in a laser light also. The combination of both looks brilliant! The AOWIN White Star Projector creates a dazzling effect for any occasion – whether the holidays, birthdays, banquets, or any special event. This light even makes a fun family activity… just turn off the lights, project stars on the ceiling, and enjoy! We like the simplicity and beauty of this projector, which is why it made our list of top holiday image effects! Coverage: This projector is not ideal for huge spaces, so if you’re looking to cover your house with stars for the holidays, we recommend purchasing multiple units. At around $20 a piece, this won’t break the bank. Mounting: This beautiful star projector can be mounted in two ways: first, simply use the included garden stake to secure the light in your yard or lawn. Secondly, an included hanging bracket allows you to set this product on the ground, or secure it to a wall, the ceiling, or even trussing. Simply use an allen wrench to tighten the hanging bracket. 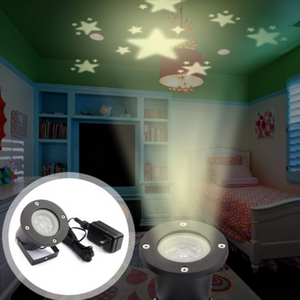 LED Lights: The AOWIN white star projector utilizes soft white LED lights, which will not harm your eyes. LEDs are power efficient and won’t run up your electricity bill. The stars projected from this unit are warm, romantic, and festive. Weather Resistant: Although this star projector is marketed as “all weather,” the manufacturer specifies that you should not expose it to heavy rain or sprinklers. It’s rating is IP44 (65 is more typical for these types of products), so just be aware of this fact. If you live in an area that gets snow and heavy rain, you might want to limit your use of this light to indoors. Or at least find a sheltered, semi-covered space to place it to avoid damage. This projector produces white stars that are warm and beautiful. In terms of quality there are no concerns. One thing to take into account: how big of a space are you hoping to fill with projected stars? If it’s a massive space, consider investing in several of these projectors. Depending on the job, one may not be sufficient. 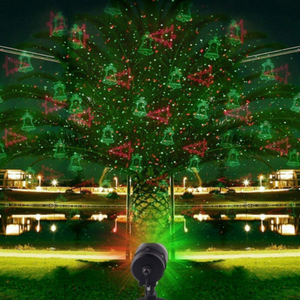 The Yoyokit Star Shower is a beautiful red and green Christmas laser light projector, which projects 5 lighting patterns: Christmas trees, stockings, Santa Clause, bells, and stars. This product produces more than 5,000 red and green laser dots covering an area of 3,000 square feet (at 33 feet). Please note, this product is not designed to withstand extreme weather including rain, snow, sprinklers etc. 5 Lighting Patterns: One thing that impresses us about the Yoyokit Star Shower is it’s diverse lighting patterns. You’re not stuck with one choice or image, but can enjoy multiples (see list above for details). Remote Control: It’s nice to forget the hassle of manually turning your lights on/off. This Christmas image projector comes with a handy remote, so you don’t have to trudge outside in the cold just to turn it on! According to the manufacturer, this product is suitable for all types of weather. This doesn’t appear to be the case. In reading Amazon reviews, quite a view people report that after the product was exposed to moisture, it either quit working or didn’t work as well. Some report that after exposure to water the laser faded, or one color dropped out. Before investing in this product, please carefully consider the environment in which you’ll be using this laser projector. Our advice? If you plan to use it in a covered space or indoors, go for it! If there’s high risk of the light being exposed to rain or snow, maybe consider a different light. Several of the other holiday image projectors in this article have IP ratings of 65 – which are ideal for such conditions. 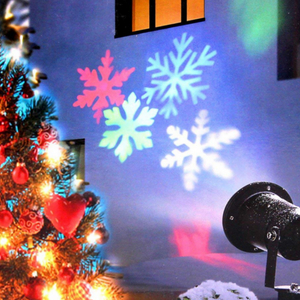 The Window Wonderland Window Projector System is a full color motion holiday projector that turns any ordinary window into a festive masterpiece! There are a few things notable about the Window Wonderland: it’s extremely affordable without sacrificing quality, easy to set up, and comes with 12 16-second movies! As we explore the specifics of this product, you’ll see why we consider it the best holiday projector on the market right now! Full Color Movies: In watching or reading Window Wonderland reviews, you will notice that every included movie plays in full color. This adds a beautiful and stunning vibrancy to your Christmas setup. We love the fact that this projector is eye-catching and draws in those walking by! Your neighbors and friends will enjoy pausing to watch the show. Show Variety: As mentioned previously, this outdoor holiday projector comes with 12 movies: 6 Christmas and 6 Halloween. 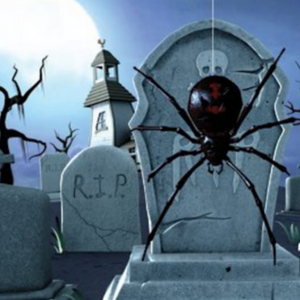 You aren’t just limited to the winter holiday season, but can enjoy spooking your neighbors with exciting Halloween thrills during the fall season as well! These festive holiday videos are pre-installed making it effortless to play them. Projection Screen: The Window Wonderland Projector comes with a 4-foot by 6-foot white translucent rear projection screen. Simply set up the screen in your window, aim the projector at the screen from inside, and viewers on the outside will enjoy the beautiful (or spooky) screen from outdoors. Point being, setup is simple and hassle-free. There are no complicated parts or tricky mechanisms, which means your holiday show will be up and going before you know it! 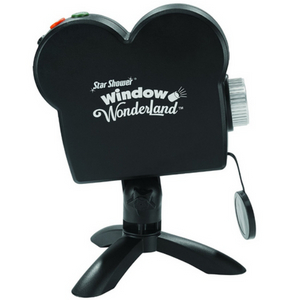 360-degree Stand: The Star Shower Window Wonderland comes with a sturdy stand that rotates 360-degrees effortlessly. This makes it simple to adjust, ensuring the projection is aimed directly at the screen. You won’t have to shift the stand continuously – with a simple turn can line everything up. Indoor Use: A frequent question regarding this Christmas projector is whether it can be used outdoors. The Window Wonderland is certainly meant to delight your neighbors outdoors, but should be set up within the comfort of your home. It’s not designed to withstand extreme weather elements. Sound Options: An included audio jack gives you the option of including sound with your videos (speakers are sold separately). Step up your holiday decorating game by adding some festive music or sound effects! Thank you for checking out our article on the best Christmas laser light, and other fun lighting effects! During the holiday season, it’s likely you’ve seen or heard about popular models like the Startastic Max and Star Shower Laser, but hopefully now you’re equipped with a little more information. Finding the best Christmas light projector or laser can be overwhelming – sorting through hundreds of products is tiring and often the quality is questionable. We’ve reviewed a wide variety of fun effects including: snowflake lighting projectors, RGB laser lights, outdoor laser light shows, motion holiday projector, and red and green laser lights. One of the greatest aspects of all these products is their affordability and versatility, allowing you to experiment and create a Christmas display that’s unique and exciting. Finding the best Christmas light projector makes all the difference! We sincerely hope these reviews and tips help you have a happy holidays (or whatever season it is)!